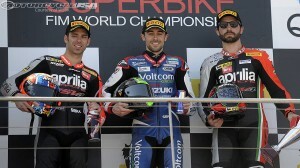 Marco Melandri had a positive start at the Australian Phillip Island round of WSBK this weekend. After aggressive riding that spanned the whole race – Melandri managed to hold off Guintoli and claimed 2nd position – his first podium of the season. The second race did not go so well – an eighth for Spidi and Nolan pilot Melandri.